And, using this 28Si they have extended to three minutes -- from a matter of seconds -- the time in which scientists can manipulate, observe and measure the processes. 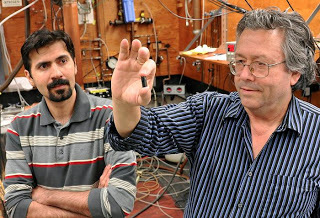 "It's by far a record in solid-state systems," Thewalt says. "If you'd asked people a few years ago if this was possible, they'd have said no. It opens new ways of using solid-state semi-conductors such as silicon as a base for quantum computing. "You can start to do things that people thought you could only do in a vacuum. What we have found, and what wasn't anticipated, are the sharp spectral lines (optical qualities) in the 28Silicon we have been testing. It's so pure, and so perfect. There's no other material like it." Quantum computing is a concept that challenges everything we know or understand about today's computers. Your desktop or laptop computer processes "bits" of information. The bit is a fundamental unit of information, seen by your computer has having a value of either "1" or "0." That last paragraph, when written in Word, contains 181 characters including spaces. In your home computer, that simple paragraph is processed as a string of some 1,448 "1"s and "0"s.
But in the quantum computer, the "quantum bit" (also known as a "qubit") can be both a "1" and a "0" -- and all values between 0 and 1 -- at the same time. Says Thewalt: "A classical 1/0 bit can be thought of as a person being either at the North or South Pole, whereas a qubit can be anywhere on the surface of the globe -- its actual state is described by two parameters similar to latitude and longitude." Make a practical quantum computer with enough qubits available and it could complete in minutes calculations that would take today's super-computers years, and your laptop perhaps millions of years.